Pamela and John met in a bait and tackle/restaurant and hit it off immediately. Pamela modeled with Wilhelmina Modeling Agency in New York until her mid-twenties traveling the world. She graduated college with a Master’s Degree within three years. John, an attorney in Richmond, loves the outdoors. He fishes and hunts but his true love is Pamela. 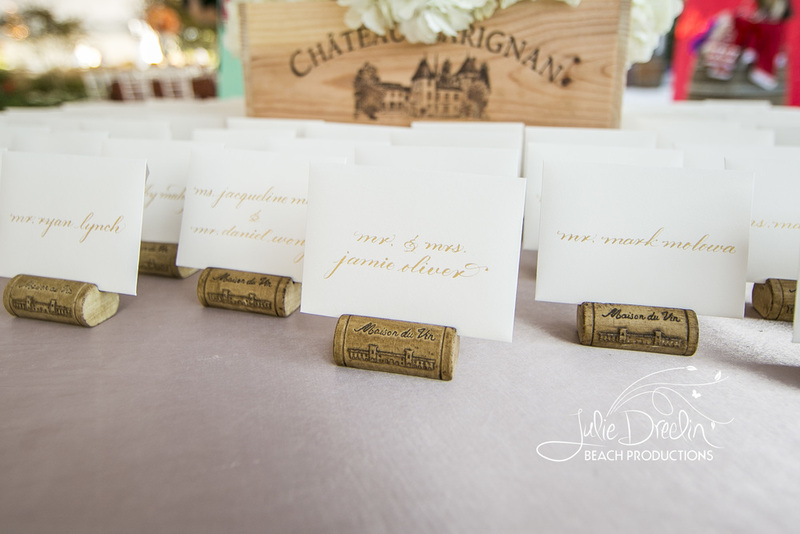 Being the granddaughter of a peanut farmer, Pamela’s mother, Bonnie, arranged for thousands of peanuts to be used as favors for the wedding with custom stamped bags for the guest to carry out their favors. The families shared their pie recipes and had them served to guests instead of wedding cake along with the copy of the recipes. Duck decoys were used in the buffet lines and the groom provided all of the meat for the gaming station. The brides taste was showcased in crystal chandeliers and a beautiful lounge for guests to enjoy a cocktail. The 400 guests danced the night away with their band who kept the party going. This wedding was considered “The Wedding of the Year” if not the decade on the Outer Banks. No detail was spared for this Cornell Alumni couple's fall wedding. Details included a custom made dance floor of wine crates; dyed white carpet to match the tent that was hand laid over a sub-floor atop a landscaped front yard; hand cut floor to accent the landscaping; varying heights of crystal chandeliers from ten feet to three feet; a concierge service to greet guests, show them their seats and attend to their every wish; a bathroom attendant to restock and freshen the bathrooms; and a Lady in Waiting for the bride who served as her personal assistant for the day. This Southern style wedding in the spring was a romantic and feminine affair with smiles and hospitality for which the South is known. 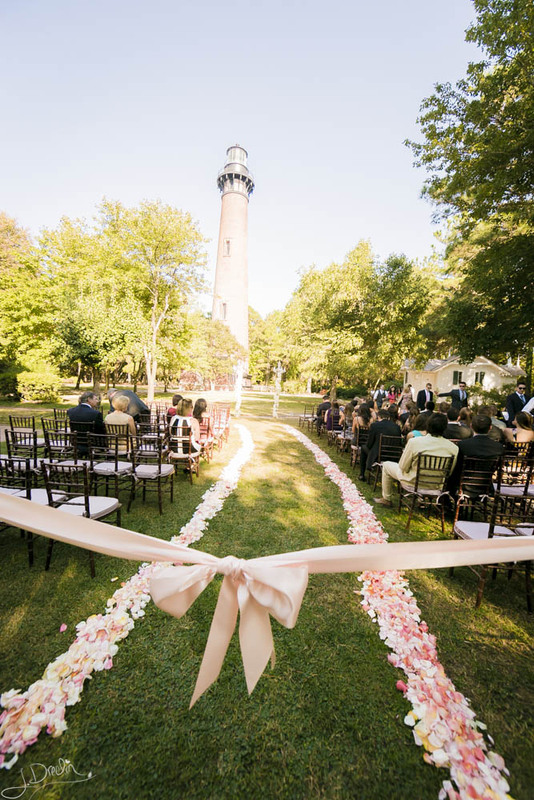 Pink and grey complemented the neutral background on these beautiful venues on the Outer Banks. The love was felt and seen in the stolen kisses and romantic gestures of the bride and groom throughout the night. Set by the sea this wedding features classic touches of pale roses, English ivy, satin ribbon, crystal and silver and a clear tent for the reception to celebrate under the stars. The breathtaking flowers are the stars of this event, setting the tone for romance. This DC couple fell in love on the beach and wanted a beach wedding but not a barefoot casual wedding. Together with Gena the couple chose a City Meets Beach theme to incorporate beach elements into a modern, formal affair. The gorgeous blue lighting hinted at the ocean but transformed the space into an elegant night club atmosphere. The modern white leather lounge furniture outside with the white capiz shell chandelier incorporated the theme outside! 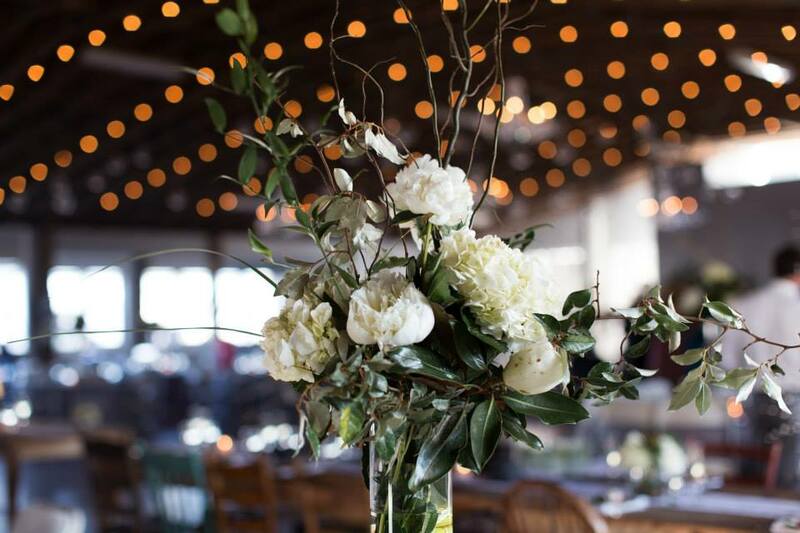 The "city" details Gena put together gave the event an upscale, trendy vibe while honoring the place where the couple fell in love - the beach!